Sambar powder is the quintessential spice mix you will find in most South Indian homes. 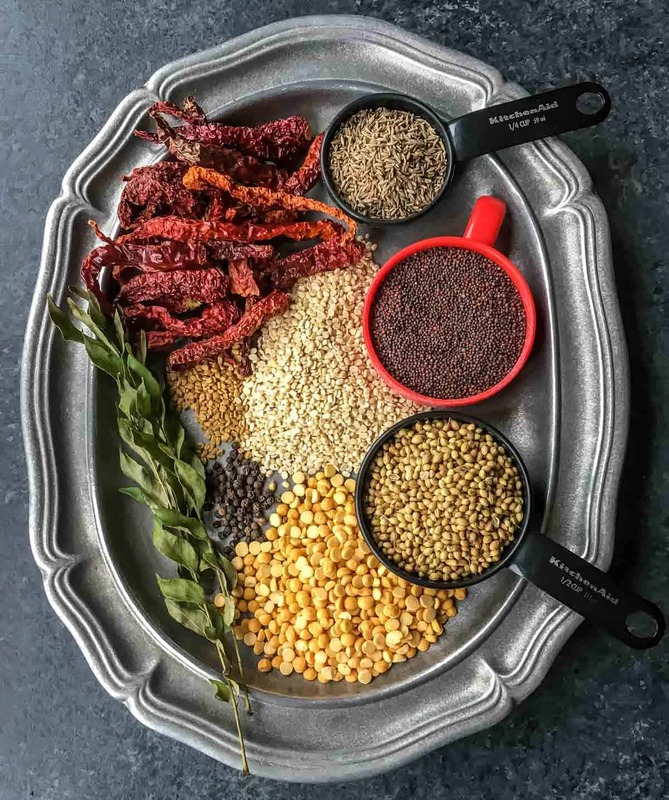 This aromatic spice blend transforms ordinary lentil-vegetable dishes into delicious, wholesome stews called sambar that is often served along with rice, idli or dosa. 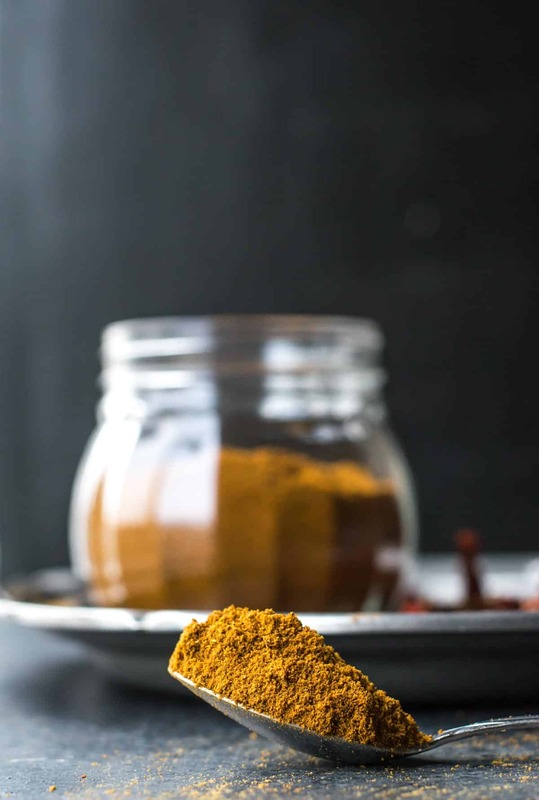 Having spent most of my adult life relying on store-bought masalas, I finally decided to venture into the world of making spice blends or masalas at home. 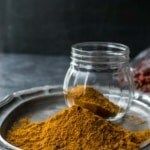 There is nothing wrong in using store-bought masalas – they are convenient but once you get used to the idea of homemade masalas there is no looking back. On my last visit to India, my aunt brought me her homemade sambar masala to take home to the US. It smelled so good that at the first opportunity I got, I made sambar. That’s when I realized what I had been missing for all these years. The sambar tasted delicious, lip-smacking and I was transported to a South Indian household. Don’t get me wrong, I love MTR sambar masala and have used it for years but fresh homemade masalas have a charm of their own. So when I ran out of her masala, I pestered her for the recipe and she kindly obliged. 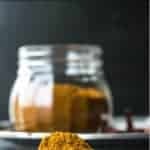 How to make homemade Sambar powder or Sambar masala? Sambar powder is made by frying spices such as byadgi chillies (a mild variety of dried red chilies found in Karnataka known for its color), methi (fenugreek seeds), channa dal (split yellow chickpea lentils), urad dal (skinned and split black lentils), dhania (coriander seeds), rai (mustard seeds), jeera (cumin seeds), whole black peppercorns along with curry leaves and then grinding them to a fine powder. First, gather all the ingredients. Make sure the ingredients are fresh and haven’t been lying around for ages. They need to be fried in a certain sequence because some ingredients burn quickly and you want to introduce them last. That is why follow the recipe to a T.
This recipe yields a sambar masala that is mildly hot so that you can adjust the heat level as you cook. If you prefer it really hot, increase the number of black peppercorns used from 1 to 1.5 teaspoon. 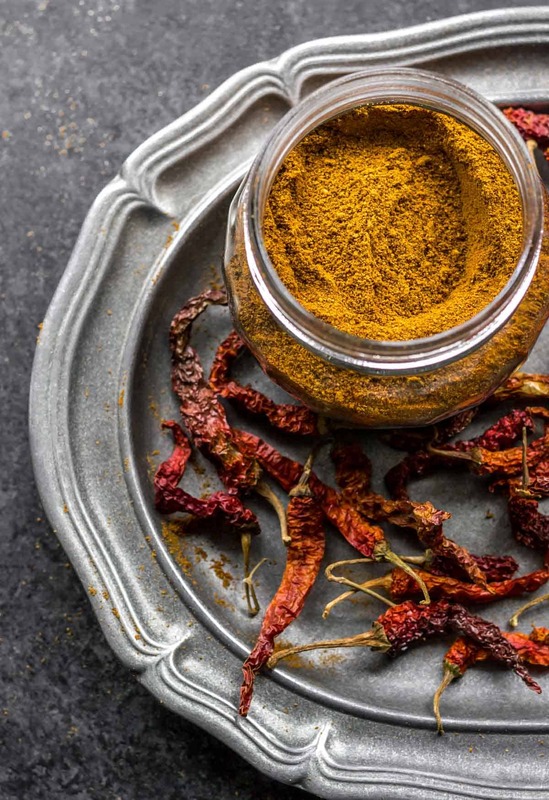 If you do not have byadgi chilies, you can substitute it with Kashmiri red chilies. The color of the sambar powder may vary (from deep red to golden brown) depending on the ingredients used (mainly the chilies), how long they have been fried. So, if yours turns out a slightly different color, it is okay. 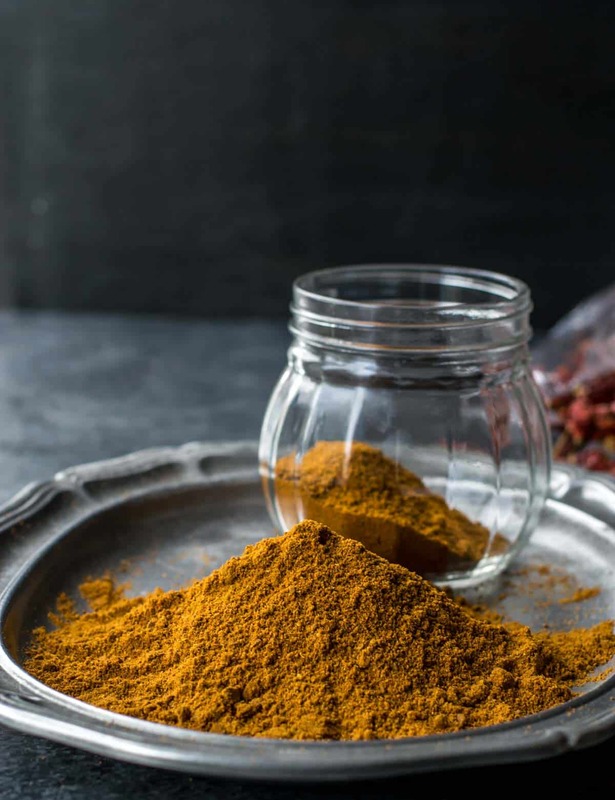 If you end up burning the ingredients, don’t use them – the sambar powder will end up ruining your curries. You can fry the ingredients in oil or without it. I prefer to do it with oil – just personal choice. and if you are looking for a sambar recipe, I have one as well that you can make either using a traditional pressure cooker or an electric pressure cooker such as the Instant Pot. 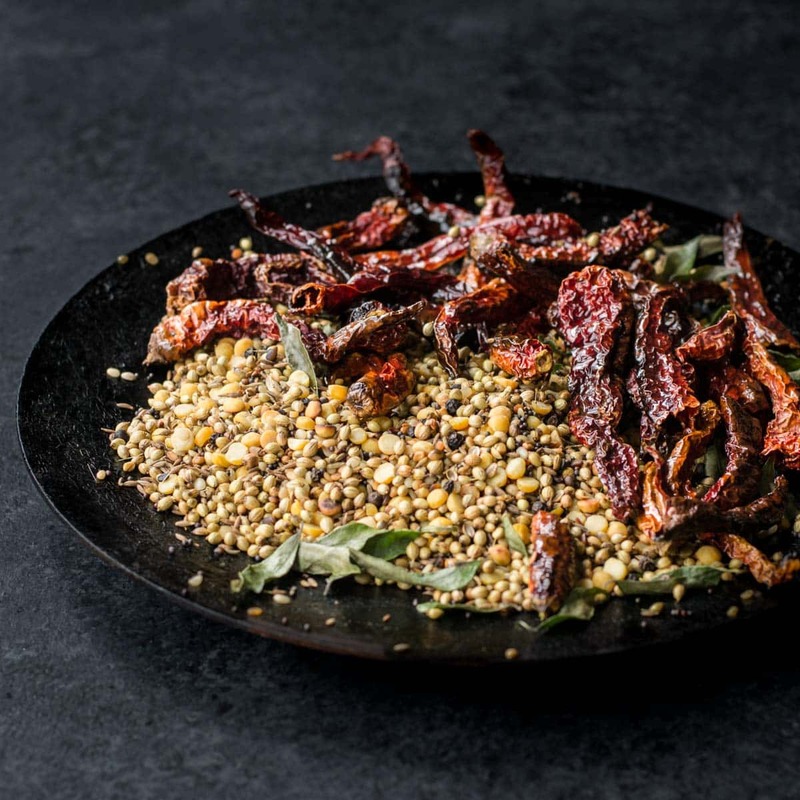 In a pan kept over medium-low heat, add oil and once it heats up, add byadgi chilies and fry them till they are aromatic (approximately 50-60 seconds). Remove the chilies and set them aside on a plate to cool. Add methi seeds, fry them for 10 seconds or so before adding channa dal, urad dal, coriander seeds, mustard seeds, and peppercorns. Fry them till they turn aromatic. Add cumin seeds and curry leaves. Fry them for another 10-15 seconds and turn off the gas. Take the pan off the heat and let it cool down for 15-20 minutes before grinding them to a fine powder along with the byadgi chilies. If the mixture is warm after being ground, transfer it to a plate and once it cools down, transfer the powder to an air-tight container and store it in a cool place. Stores well for 2-3 months. 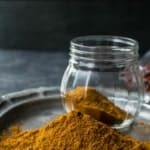 Variations - Some folks add hing (asafoetida) and turmeric powder while making Sambar masala while I prefer adding it when I am making sambar. Hi Anu, Thank you for sharing your aunt’s recipe for homemade sambar powder. So once I have made the powder, how do I make the sambar please? I also use readymade MDH sambar masala. I haven’t thought that homemade masala will enhance the taste of sambar. I will try to make homemade sambar masala and use it in my sambar recipe. Definitely, I will tell you.